Excellent addition to the mini-keyboard market. Packs in more keys than the competition. 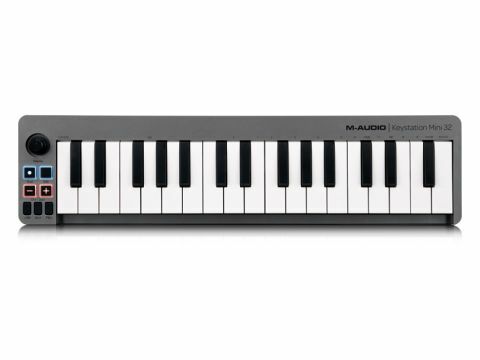 Here we have M-Audio's attempt to grab a slice of the burgeoning mini-keyboard market, and it gives you two and a half octaves of low-profile keys to work with. This means that you can just about get away with two-handed playing, though you couldn't exactly deliver a piano recital on it. The keys play pretty well, though, and assignable controllers include a pleasantly chunky knob and three buttons (these default to controlling pitchbend up/down and modulation). There are backlit octave up/down (with limited re-assignability) and sustain buttons, too, plus a further one for entering edit mode. The Keystation Mini 32 certainly looks the part, and it performs well. It's priced to compete directly with Akai's LPK25, and while the Mini 32 lacks its rival's arpeggiator, its extra keys will be a deal-maker for some.